So, this may perhaps be a vain pursuit as the semester goes on, but I realized recently that I don't have very many pictures of my yarn stash. Which is too bad, because my stash is pretty awesome and deserves to be drooled upon more regularly. So here goes: the first installation of Stash Appreciation Wednesday, in which I take pictures of my yarn and talk about how great it is. I had heard a lot about Madelinetosh, and remembered having seen it at The Weaving Works one of the last times I was home. 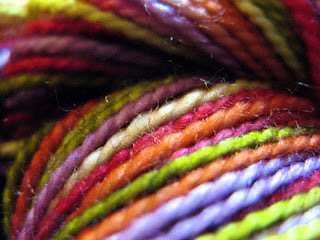 Overall impressions: yarn has a similar twist to Claudia Handpainted, which is one of my favorite sock yarns ever in terms of both knitting and wearability. 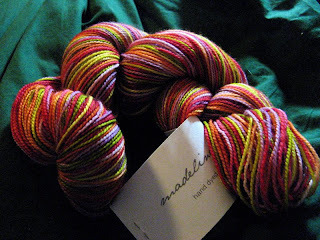 I love the saturated colors and the yarn itself is insanely soft. 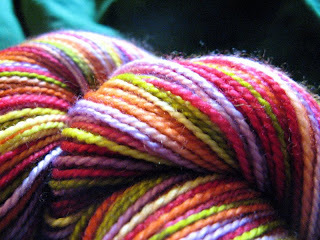 This is probably one of the prettiest skeins in my stash - so pretty, in fact, that I almost don't want to knit it up. .... key word being "almost". I should be at Smith's tomorrow. I need some more Coryzors in my life.